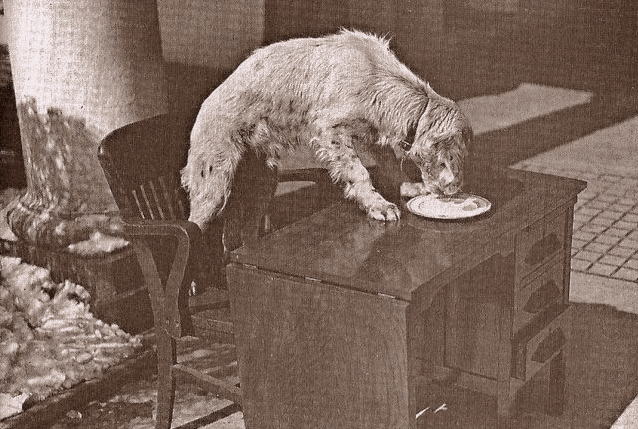 FDR’s dog Winks tears through a breakfast plate. President Franklin Roosevelt’s beloved dog, Fala, is one of the first animals that comes to mind when many Americans think of presidential pets. Before Fala, one of FDR’s favorites was a Llewellin setter, a purebred strain of the English setter, who was named Winks for the black ring around his left eye. The President, who had polio, frequently spent time in Warm Springs to take advantage of the therapeutic waters there. Many of the Roosevelt dogs had a bit of a mischievous streak in them, and Winks was no exception. According to an account published in the Feb. 27, 1934 edition of the Pittsburgh Press, Winks discovered an unattended table in the White House that was filled with breakfast food. The puppy went from plate to plate, gobbling up the breakfast of bacon and eggs that had been prepared for 18 people! Winks was buried at a pet cemetery in Silver Springs, Maryland.